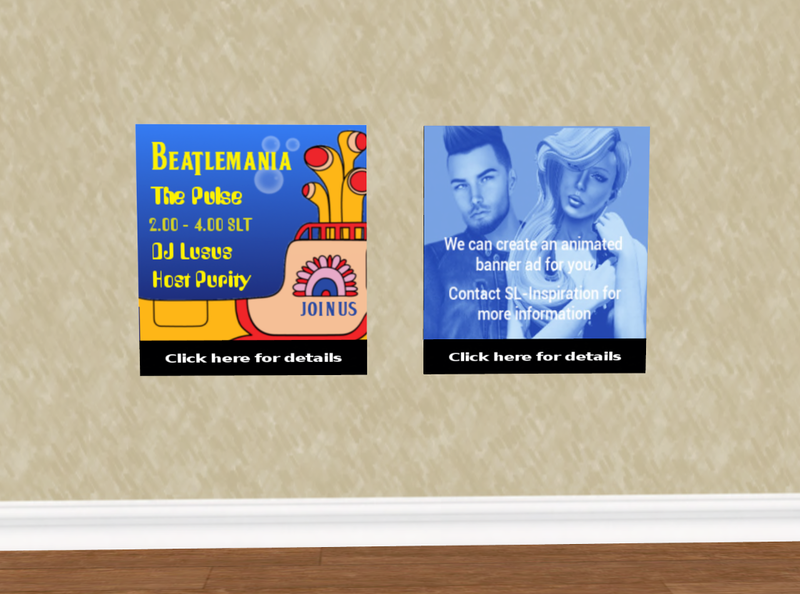 If you have a club or plan to hold an event in Second Life, creating an in-world advertisement can be a major boost to getting people's attention. One eye catching possibility is to use animated images, and one of the smartest ways to do this is to use HTML5 advertising banners. HTML5 advertising banners work in Second Life as media on a prim which means they won't lag the land they are rezzed on. The images load smoothly and appear in good quality, and an added bonus is the ads can also be displayed on yours and friends' blogs, increasing your reach exponentially. 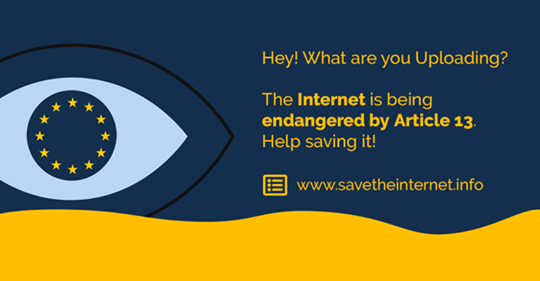 If the ad is added on a website a link can be included, (hover your cursor over the ad to the right and you'll see the link address to the bottom of your browser). 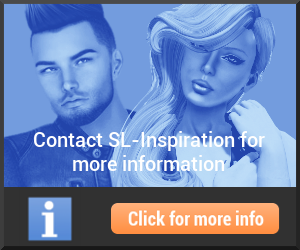 The image below shows two HTML5 adverts rezzed in the SL-Inspiration location in world, and although they can't show the animation, the advert in the sidebar here gives some idea of the quality. Another popular way of drawing attention to an event in Second Life is to send invitations to friends and group members, and using animated HTML5 images is a unique way of doing this. One thing to remember however is that the item will need to consist of two prims; one for the animation and another to contain any information such as notecards and landmarks etc you might want to share with the recipients. (You will also need to include a 'give all' script for this). The reason a minimum of two prims is needed is because the prim displaying the media won't also offer items from its contents, so another prim is needed for this. So....are there any downsides to using HTML5 animations to advertise in Second Life? The one small disadvantage is that the prim face may momentarily appear blank as the media loads. Although this can't entirely be avoided, adding a conventional image to the prim face helps a lot. Apart from this the system works extremely well. To see how HTML5 ads work on a prim you can go along to the SL-Inspiration office in Second Life to collect a copy of an advert, and see how it looks. If you hit the 'click here' area you'll be offered a folder with a copy of the banner ad so you can see how yours will look to someone recieving it as an invitation. If you would like to use your own HTML5 banner ads in Second Life but are wondering how to do this, get in touch here and we can discuss what you have in mind, and what SL-Inspiration can create for you.